This year is the 500th anniversary of the Spanish explorer Ponce de Leon landing in our state and naming it La Florida or “land of flowers’. There are over 3.600 species of wildflowers that grow in our state and at least 175 of these species are endemic, or found only in Florida. 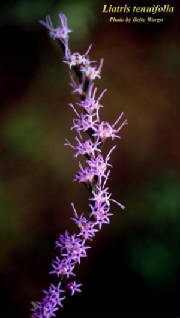 The Florida Wildflower Foundation defines “Florida native wildflower” as any flowering herbaceous species, or woody species with ornamental flowers, which grew wild within the state’s natural ecosystems in the 1560s when Florida’s first botanical records were created. When I took a weed science course, the professor told us “many weeds are just wildflowers out of place”. So, sometimes plants that we think are weeds might just be native wildflowers, but sometimes those wildflowers are definitely weedy. We have heard a lot lately about the decline of honeybees, but in reality, there is a decline in all of our pollinating insects. There are many theories about why this is happening, but two of those theories have some scientific evidence backing them. One is the use of systemic pesticides that are absorbed by plant roots and transported throughout the whole plant including nectar and pollen produced by the flowers. The other is the large expanses of monoculture plantings that cannot support pollinators all year. By planting even just a small area of native wildflowers in our landscapes we can provide nectar and pollen for these pollinators, but we must be cautious about the pesticides that we use. I prefer to use Neem oil or insecticidal soaps. I read a report of a study that was done recently to determine if flowering plants sold at nurseries contained systemic pesticide residues that could be harmful to bees, pollinators and butterflies. It results were very disturbing since there were toxic levels of pesticide found in some plants. The whole report can be accessed on the Internet at: http://libcloud.s3.amazonaws.com/93/3c/e/3115/Gardeners_beware_report.pdf. It is a long report, but is worth reading even if you only read the “conclusion” portion near the end. I would suggest that you question where you purchase plants to be sure that no systemic pesticides were used on any blooming plants you are purchasing. This is especially important if you are purchasing these plants for your butterfly garden or to attract bees and other pollinators. 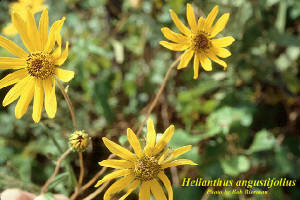 Let’s get back to native wildflowers. There are several wildflowers that can add color to the fall landscape and my favorites include Blazing Star (Liatris chapmanii, L. garberi, and L. tenuifolia), Narrow-leaf Sunflower (Helianthus angustifolius), Pinebarren Goldenrod (Solidago fistulosa) and Tropical Sage (Salvia coccinea). 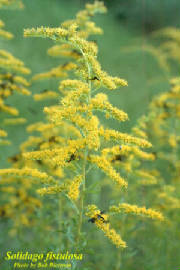 You might say that goldenrod is very allergenic, but it has been shown that the pollen from goldenrod does not induce allergy symptoms. It is actually the pollen from the inconspicuous ragweed which blooms at the same time that is responsible for the sneezing and itchy eyes. 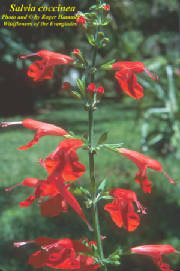 The Florida Wildflower Foundation has copious amounts of information about choosing, planting, and growing wildflowers on their website at: http://flawildflowers.org/. I encourage you to spend some time researching and planting some wildflowers in your landscape. The bees and other pollinators will thank you. For more information about Florida wildflowers, join me at the Wildflower Festival at Brooker Creek Preserve on October 26th from 9 a.m. to 4 p.m. Among the presentations are “Landscaping with Wildflowers” and “Wildflowers of Pinellas County”, along with a native wildflower plant sale and a butterfly tent. There will be activities for children and a wildflower scavenger hunt. This is a free event located at Brooker Creek Preserve 3940 Keystone Road, Tarpon Springs. September is still a bit hot, but it brings a promise of cooler days to come. It is a good month to rejuvenate your flower beds for the fall and winter growing seasons. Now is a good time to divide and plant perennials and continue to scout for pests in the landscape. If you have perennials in your landscape, now is a good time to divide them. There are three reasons to divide perennials: to control the size of the plants, to help rejuvenate them so that they keep blooming, and to increase their number. Gingers are among our finest perennial plants. During the summer months they usually produce an abundance of new growth. To assure good growth next year, dig up and divide rhizomes. Shell ginger (Alpinia zerumbet) is a vigorous grower that produces magnificent pinkish, shell-shaped flowers looking much like a cluster of grapes. Dig up a rhizome and cut it leaving an immature sprout or two on each section. The rhizomes should be planted only about two to three inches deep. The gingers require little care other than moist soil, afternoon shade and occasional fertilization. Daylilies (Hemerocallis spp.) which have grown prolifically during the summer months are now beginning a short period of dormancy. As daylilies age they produce a thick clump of growth over time which can result in weak plants that do not bloom well. Divide them by digging the entire clump up, separate each individual plant or fan and replant them a little higher than they were in the original clump. There will be a large tuber-like growths on the root system - do not remove these storage organs that help to promote further growth. Stokes aster (Stokesia laevis) is another perennial that has a tendency to become too dense so it should be divided now. The long, large roots may be reduced to make transplanting easier. 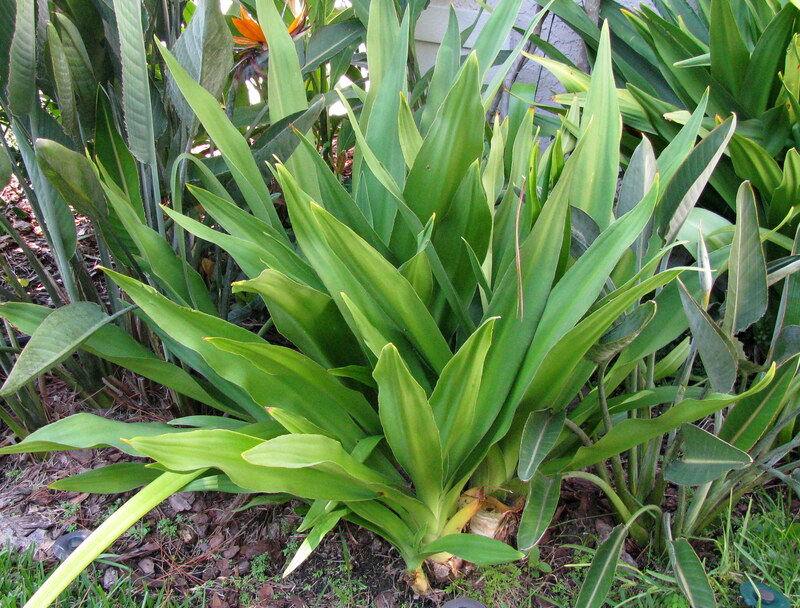 Like the daylilies, there are many plants within the clump. They should be separated and set slightly higher than their original depth. This is also the time of year to dig bulbs. Separate and plant the small bulbs that form around the large central bulb, and then replant the older bulb. Amaryllis (Hippeastrum) has a tendency to draw its bulbs into the ground. When replanting, make sure that the top 1/3 of the bulb exposed to insure blooms. This applies to other bulbs in the Amaryllis family like Spider lily /or Alligator lily (Hymenocallis spp.) and Rain lily (Zephyranthes spp). The large native Crinum or Swamp lily (Crinum americanum) can also be divided now. Whiteflies can be very damaging. Check citrus, gardenias, camellias, and other host plants. The nymphs feed on the underside of leaves. One sure sign of an infestation of whiteflies is the presence of black sooty mold on the top of the leaves. Adult whiteflies are attracted to yellow. Yellow sticky cards can be used as an alternative to chemical pesticides. Place the card near the plant so that as the adults mature they will fly to the cards and get stuck. If you use a chemical control, follow label directions carefully as some chemicals are not labeled for certain plants. Be on the lookout for fall armyworms in all types of lawns. Armyworms are the larvae of moths. When full grown, the larvae are about 1 ½ inches long, yellowish brown to black with a wide, dark stripe on each side of a midstripe that ends in an upside-down (Y) on their head. Their feeding can cause circular bare areas in the lawn. Always follow label directions when applying pesticides. Continue to watch for chinch bugs in St. Augustine lawns. They can do a lot of damage in a short amount of time. Chinch bugs are becoming resistant to the insecticides that we currently have to use. So, it is very important to rotate insecticides with different modes of action each time you treat your lawn to reduce resistance. To find mode of action for differing insecticide active ingredients see the chart in the University of Florida publication on controlling chinch bugs in St. Augustinegrass: http://edis.ifas.ufl.edu/pdffiles/LH/LH03600.pdf. Choose a different active ingredient from the "Chemical Class" column in the publication listed above to use each time you treat your lawn. Follow the directions on the label carefully, paying close attention to the safety precautions regarding the protective clothing to wear. These chemicals can be absorbed through the skin, so use them cautiously. When you apply pesticides, apply them sparingly in the early evening to reduce the harm to our bees and other pollinators.